Goldfinger is a true Bond movie: Sean Connery looking young, dapper (and intelligible) with a beautiful woman under each arm and one-liners always at the ready; mastermind villains with grand schemes for personal gain; high-tech car chases; and plenty of ingenious gadgets courtesy of Q to help him get out of scrapes. Goldfinger is undoubtedly one of the most classic spy movies of all times, embodying the best elements from the Bond franchise. 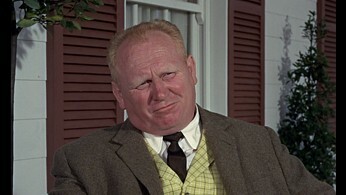 Goldfinger himself is the preeminent Bond villain: smooth, suave, willing to win by any means necessary, and deadly towards anyone who gets in his way. For a movie that’s nearly 45 years old, I was rather surprised by the picture quality on this release. It’s been treated to an excellent restoration process – just like the rest of the classic Bond films – and despite the film’s vintage there is no sign of dirt, grime, scratches or other age-related effects. Colors are bright and rich with the slightly pastel look that’s common with movies of this era. Detail is unexpectedly sharp in many scenes, and film gain is evident but kept well under control. For the most part black levels are solid, although there are a few scenes where they tend to wonder. Only the film’s matte effects show any quality issues, often looking off in color, quality or sharpness, but that’s more of an issue of having such a good transfer that blemish like that are revealed. 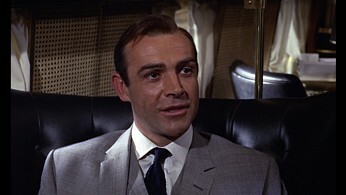 Presented in the original 1.66:1 aspect ratio (which means thin black bars on the left and right sides of the screen), Goldfinger has been given a high bitrate AVC encode that pegs the meter at an almost constant 30 to 34 Mbit for daytime scenes. The infamous “missing frames” as Oddjob drives towards the airport are, unfortunately, still missing in this release. While the picture looks so good that it hardly shows its age, the audio is another story. Despite a DTS-HD Master Audio lossless encode in 5.1 surround, Goldfinger’s soundtrack definitely sounds like it was made in 1965 and suffers from almost harsh treble levels, an almost complete lack of bass below 100hz, and a dialogue track that clips frequently. Of course these problems were commonplace back then and are likely insurmountable issues with the original mix, with this disc merely reproducing the tininess perfectly... but I still have to rate it based on the total quality level. Besides for these issues the audio is pristine, with no static, crackles, pops or other distortion. The lossless English soundtrack is duplicated with a second track in the original mono presentation (encoded as Dolby Digital 2.0 – shame this couldn’t have be done lossless as well), plus dubbed versions in Spanish Dolby Digital 5.1 and French Dolby Digital 5.1. Subtitles are offered in English, Spanish, Cantonese, Korean and Mandarin. MGM has been releasing the Bond films in collections of three. Sometimes when mass releases are done this way the studio might not offer quite as many extras for each individual film as had they been done as separate special editions, so I’m pleased to see that Goldfinger has not been short changed in this department. Most features are offered in 1080p video, with a few (of particularly low quality footage) using DVD-level encodes. 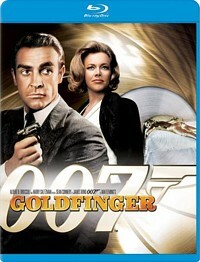 Commentaries: Two commentary tracks are included with Goldfinger. The first is with director Guy Hamilton, interspersed (rather unusually) with narration by Lee Fifer. The second track is more technically oriented and features a number of cast and crew members, and is again interspersed with narration by Lee Fifer. The commentaries are more “produced” than usual, and aren’t simply a number of people talking while watching the movie together. Sean Connery from the Set of Goldfinger (480p/2.0): A few minutes of an interview behind-the-scenes with Connery on the set. Filming the production of the movie may be commonplace now, but it wasn’t really done much back then – and it’s even rarer for such footage to survive. Thanks to the MGM vault for managing to dig up this unique clip! Screen Tests (1080p/2.0): A different actor playing Goldfinger? Here’s two screen tests that offer a look at what might have been had Theodore Biken or Tito Vandis secured the role. I think they made the right choice. On Tour with the Aston Martin DB5 (1080p/2.0): Archival footage of the famous Aston Martin DB5 touring to promote the film. This stunning (and gadget-laden) car was rather popular at the time, appearing in commercials, at auto shows and promotional events. Honor Blackman Open-Ended Interview (480p/2.0): A promotional interview with nothing but answers… that local television stations could use to insert their own versions of the questions. Sneaky! The Making of Goldfinger (1080p/2.0): An in-depth 25 minute documentary that delves behind the scenes on the making of Goldfinger. The Goldfinger Phenominon (1080p/2.0): This second half-hour documentary takes a look at the creation, marketing and promotion of the biggest and most expensive Bond movie at the time. Original Publicity Featurette (480p/2.0): A short behind-the-scenes publicity clip used to promote the movie, starring Oddjob (or at least the actor playing him). Ministry of Propaganda (1080p/2.0 & 480p/2.0): This section includes the original theatrical trailer, 3 television spots, 33 radio ads as well as an open-ended radio interview with Sean Connery. You really can’t more complete than this! Image Gallery: A large collection of stills sorted into a wide range of categories. Unfortunately the photos are shown on-screen rather small, with a huge amount of waste space around them. When I want to see photos, I prefer more photo than fancy shaded background! 007 Mission Control: Subcategorized into sections such as “Women”, “Villains” and “Exotic Locations”, these are collections of links to various portions of the movie. Pick a category and watch all the clips from the movie that meets that criteria. It’s been so long since I’ve seen Goldfinger that watching it on Blu-ray was much like seeing it again for the first time – and how well it has stood up to the test of time! With iconic scenes, forever memorable dialogue and one of the most classic Bond henchmen ever, Goldfinger deserves to be on everyone’s bookshelf. This movie may also be purchased as part of the third James Bond Blu-ray collection.